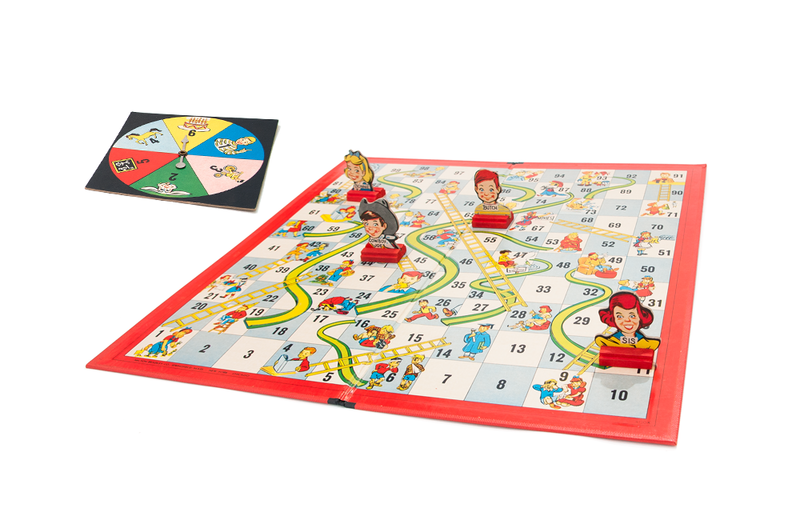 Chutes and Ladders has been a hit with the kindergarten set since it was introduced in the United States in 1943, by Milton Bradley. The colorful 10 x 10 game board contains squares numbered 1 to 100. The first player to spin his or her way to square #100 at the top of the board is declared the winner. The ongoing appeal of the game lies in its simplicity of gameplay. The concept of the game is more ancient than its 70-year history. Chutes and Ladders is based a game called Snakes and Ladders, which dates back to India in the 2nd century B.C. The original helped children learn counting and number recognition, and was also used to impart lessons in morality. Snakes were allegories for various vices, and landing on a snake’s head would cause a player to slide down the board from the top to the bottom of a snake. Conversely, ladders represented virtuous activities and players who landed at the base of a ladder quickened their ascension by climbing the ladder to bypass a number of squares. Explore classic toys and games that captured our attention and never let go. 7 not so trivial facts about the game. First introduced by Ideal in 1971, Rebound is a table-top shuffleboard for 2 to 4 players, ages 10 and up.